1. Ask Jesus to bring to your mind two or three friends and invite them to your home or maybe even your break room at work. 2. Find Creative ways to worship. If you have access to a computer or smart TV, there are all kinds of worship songs and hymns available with scrolling lyrics on Youtube (See resources below). If it is too uncomfortable to sing in your small group, just let the worship music play over you and engage in the sweet presence of Jesus. 3. Spend some time studying the Bible together. A friend in the Malachi Network (Joshua Hawkins) has produced over 60 short video teachings on the life of Christ (See resources below). 4. Make sure to leave time to pray together. Don’t just pray for your needs, ask the Lord to show you His purposes in the world, our community, our churches and our homes; then agree with Him in simple prayer. 5. Care about others around you, invite them to join you and help them start new SCOPE groups. When you start a SCOPE community, let us know! 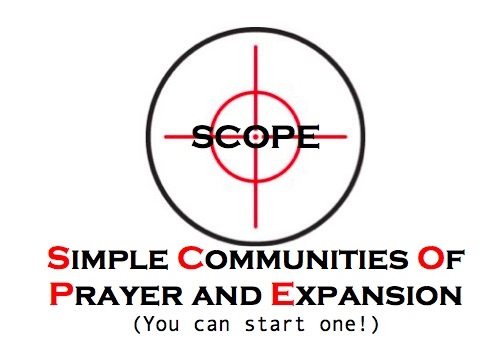 We want to develop a growing list of SCOPE gatherings, continue to resource each group and celebrate the spontaneous expansion of Christ’s Kingdom in this region! Click on the picture below to view over 60 short video teachings on the life of Christ by Joshua Hawkins. Click on the pictures below for the following worship songs with lyrics. Just found out about u guys in Avalon, I am so excited to ring my family to next Sunday beach !! Great to have found out of this! I don’t like missing church when I visiting family in Avalon and not at my home church in philly, thank u!!! Maria, can’t wait to meet you!